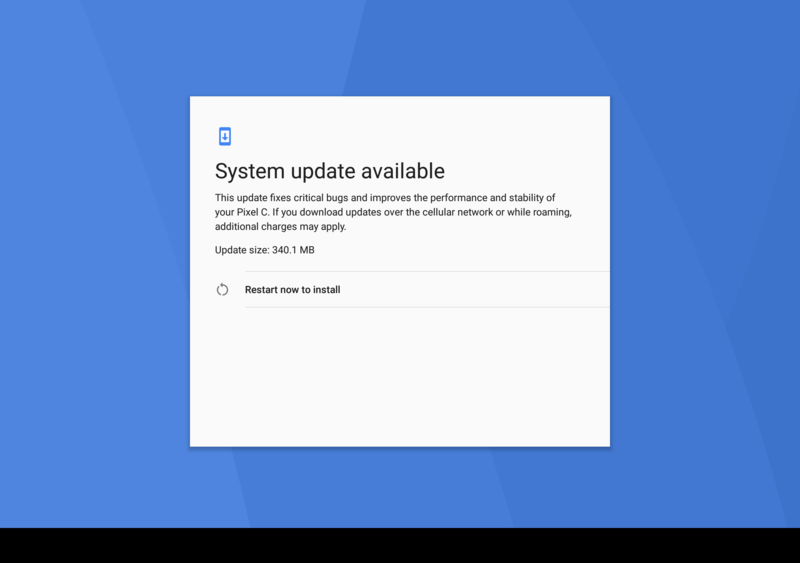 Google has started rolling the new Android 7.1.2 update to the Pixel C devices and this new update also brings the April security update for the tablets. A Reddit user has shared the screenshot from the update notification from their Pixel C. The update is currently rolling out to the Pixel C tablets and is expected to be available soon for the other Pixel devices including the Google Pixel and Pixel XL smartphones, Nexus 6P, Nexus 5X and the Nexus Player as well. The new update comes with 340MB in size and brings the Pixel Launcher and the new on-screen system buttons. The update also brings a slight change and moves the icons in the navigation bar closer to the edges of the screen. Apart from these the update also brings the Android security update that fixes various security vulnerabilities and makes it more secure than ever. To manually check for the updates for your Pixel C tablet, you can go to Status menu and click on the System updates option to check for the latest updates available for your tablet. Make sure you have above 50% battery available on your tablet and it also have enough storage to store the new update. The update might be available soon for the Pixel smartphones and Nexus devices as well. The Search engine giant was testing the new Android 7.1.2 update from a long time and has finally started rolling it. We may have to wait for the Search engine giant to make it available for other Pixel devices as well. The Google Pixel C was launched back in the year 2015 with features including a 10.2-inch 500 nits 16:9 display with 2560 x 1800 pixels resolution and 308 PPI. It is powered by a NVIDIA Tegra X1 processor with 256-core Maxwell GPU and comes with 3GB of LPDDR4 RAM along with 32GB / 64GB internal storage. It runs on the Android 6.0 (Marshmallow) OS out of the box and it features an 8-megapixel rear camera and a 2-megapixel font facing camera. The Pixel C comes with a 34.2 Wh battery along with a 15W USB Type-C adapter. it comes with Wi-Fi 802.11a/b/g/n/ac 2×2 MIMO, dual-band (2.4 GHz, 5.0 GHz), Bluetooth 4.1 + HS USB Type-C connectivity options. It measures 242 x 179 x 7 mm and weights 517 grams. The Pixel C also comes with a number of sensors including Gyoscope, Accelerometer, Ambient Light Sensor, Proximity Sensor, Compass and Hall Effect Sensor.